If you love the sweet, toasty flavor of Bananas Foster, you will love the flavor infusion of rum, bananas, brown sugar, and butter in this Bananas Foster flavored coffee. With real 100% Arabica beans and only 2 calories per cup, you can't go wrong with this famous dessert in the form of a mildly roasted coffee. 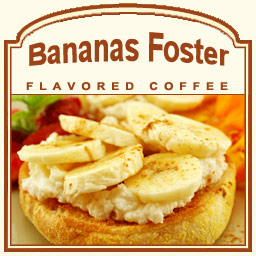 Sweet without the stickiness, you can indulge in this full-flavored Bananas Foster coffee with its rich flavors � guilt free. In a heat-sealed valve bag, you can expect the freshest coffee possible that is roasted and shipped on the same day. Bananas Foster has been a popular dessert since 1951 and with its vanilla, brown sugar, and banana inspired flavor, we know you will love the Banana Foster flavored coffee and its full-body of deliciousness.